Villages or areas at high altitude where government officials and others were stationed to avoid the heat of a tropical summer in India and S.Asia. We felt as though we had stumbled upon a secret when left the hot and humid plains of Kerala to climb into the cool, emerald green hills of Vythiri in the Western Ghats mountain range. 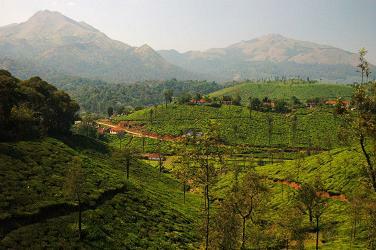 Kerala and Tamil Nadu are not often thought of by foreign visitors as mountaneous states, but the mountains of the border that they share soar to heights of over 2000m. The first time I visited Kerala, I never saw or even knew of the existence of the mountains that towered out of sight somewhere to the east. On the second trip we happened to talk to someone who had lived in Kodaikanal, Tamil Nadu who was able to tell us about the beautiful scenery of the mountains. We had a motorbike and plenty of time, so we decided to explore the Western Ghats region. There we found astounding views, mile upon mile of tea plantations, high waterfalls plunging through thick green forests, cloud-filled valleys and an area of India that felt like a very well kept secret. 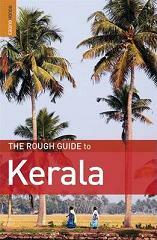 This page lists the hill stations of Kerala and Tamil Nadu that we spent some time in while travelling. They are organised north to south as if travelling 'down' India. Click on the links or the pictures for further, detailed information such as things to do, accommodation, food - and more pictures! Wayanad is a district in north east Kerala that is famous for its wildlife reserve, its tea and coffee plantations and the hills of the Vythiri region. Shrouded by mist in the cool mornings it sometimes feels that even the air here is green, wound as it is around boughs coffee plants, eucalyptus and silver oak. Read more about Vythiri in Wayanad, its nearby attractions, towns plus pratical information. Personal recommendations are included, and things that are not to be missed! Home of undoubtably one of India's best and oldest botanical gardens Ooty is located in the Nilgiri mountains (the 'Blue Mountains') which form part of the Western Ghats range. The busy town is surrounded by green hills of tea and is the destination of the The Nilgiri Mountain Railway - a steam train that puffs up the steep mountains offering breathtaking views. 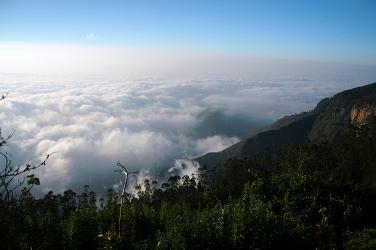 Nearby town of Coonoor is a good quiet alternative to the bustling Ooty. 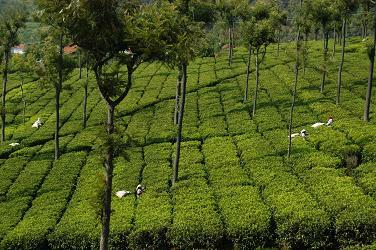 Read more about Ooty and Coonoor. Located in Kerala's Idukki district, Munnar is a place of breathtaking scenery around an interesting hill station town where excellent street food cafes pop up every night selling yummy, cheaper than cheap food in a lively atmosphere. 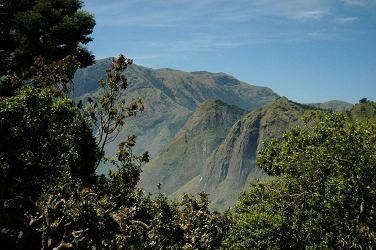 Visiting nearby Top Station gives a panoramic view of the Western Ghats that is absolutely unforgettable. For information on accommodation, eating and things to see, click here.